Brian was born and raised in Middlebury and graduated from The College of Wooster with a degree in Sociology. After moving back to Vermont, he developed a passion for political and community organizing, beginning with the Vermont Democratic Party in 2014 and continuing in earnest on Bernie Sanders’ 2016 presidential campaign. Inspired by that experience, Brian returned home to Vermont to help direct the field operation of the Vermont Democratic Party’s 2016 Coordinated Campaign. Most recently, he was part of the organizing team for Let’s Grow Kids, advocating for high-quality, affordable child care in Vermont. He has also worked for the Vermont Speaker of the House’s office and for the Vermont State Employees Union. 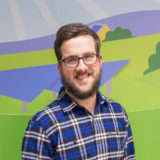 Brian’s enthusiasm for the environment and for his local community bring him to SunCommon, and he is excited to help bring affordable solar energy to more Vermonters. In his spare time, he enjoys skiing and hiking in Vermont’s beautiful outdoors and fantasizes about adopting many, many dogs.